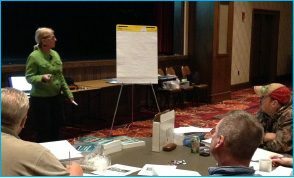 Kay Curtin of the Metropolitan Council of Environmental Services was invited to our latest training to help us dive deep into the latest information on wastewater today. The week of April 23rd was very deep for us. We gathered together to deepen our knowledge of the latest regulations, happenings and safety standards in the industry. Our keynote speaker was Kay Curtin of the Metropolitan Council of Environmental Services, a Level A Operator with a depth of experience. Specifically, Kay spoke to the latest information on activated sludge, anaerobic digestion, attached growth systems, clarifiers, grit separation and removal and more.